I'm a huge fan of blog syndication. I write a post once on my Web Ink Now blog, push the button, and it appears in many places such as my Amazon page, sites like MarCom Professional, the search engines, Newstex Blogs on Demand, and more. But many bloggers don't understand how syndication works and why it is important. And some are downright fearful of syndication. The ability to provide blog content to many places through syndication is incredibly valuable. With no extra work, syndication allows you to reach a potential audience of millions of people you would not otherwise reach. 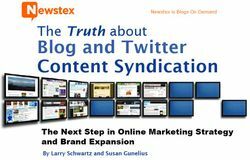 A new free ebook from Newstex called The Truth about Blog and Twitter Content Syndication, helps you to understand what options are out there and what might be right for you. Disclosure: I syndicate my blog through Newstex and I am an advisor to the company.